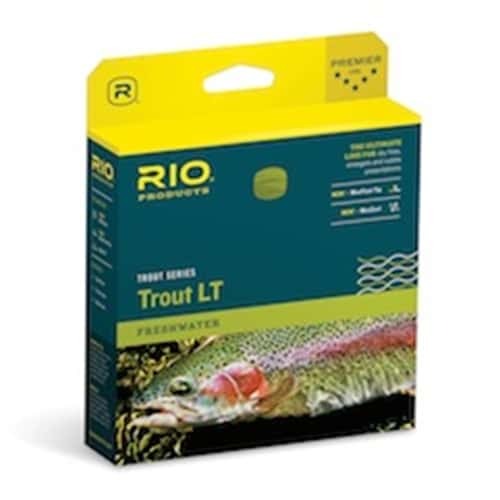 RIO’s latest trout fly line has been designed for the ultimate in performance for traditional trout fly fishing techniques. A long, delicate front taper ensures the softest of presentations, making the line perfect for fishing dry flies, soft hackles, emergers, small nymphs and chironomids, while an extended body gives the line stability at range and makes mending and roll casting easy. The weight distribution helps load a fly rod when fishing at short range or on smaller rivers and creeks, though it is manufactured precisely to the AFTMA standard and is ideal for all but the fastest of fly rods. The Trout LT is created with a supple braided multifilament core and features an extremely soft, memory-free AgentX coating which makes these high floating lines incredibly easy to lift quietly off the water and ensures that they are totally memory free. RIO XS Technology results in a very smooth and slick, dirt repelling finish, while the Super Floatation Technology ensures that the line tip doesn’t sink. All lines have a welded loop on each end except on the DT lines where delicacy is of the utmost importance. The unique profile of the double taper easily transfers energy to the tip and, with the longest tapers of all, is the ultimate presentation fly line. Fishing on day on the Clark Fork I noticed my line tip sinking. I was using Scientific American MPX. That line has a heavier tip and a more radical taper. That line is good in a breeze but it can tend to sink and spook line shy fish. So, I switched to my spool with Rio Trout LT and bingo! My line stopped sinking. More importantly, the customer service here is great! Also, they delivered all of my purchases in time before I departed to my fishing trip.